Public consultation on developing a strategy to deliver an electric vehicle charging network across Herefordshire, Shropshire, and Telford & Wrekin is now underway. Green Shropshire Xchange is hosting this public consultation to seek wider consideration of the draft strategy and action plan. You are invited to access the various documents and comment accordingly to suggest changes to the text, share your own ideas, offer help or even possibly to host a new charging point. The closing date for responses is 5.00pm, Monday 17 September 2018 to enable as many individuals, organisations, businesses, town and parish councils to respond. 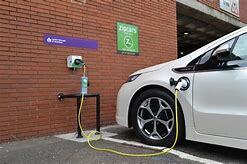 This initiative arose from a realisation that the existing ‘network’ of electric vehicle charging points in the Marches area is both low in number and limited in its geographical coverage with no-one having any strategy nor funding to develop a strategic network. There is a little piecemeal activity but no coherent approach nor co-ordination so the challenge is to develop such a strategy and action plan. The aspiration is to work towards both widening and deepening the existing ‘network’ which is increasingly important in light of the government’s announcement last year of an end to the sale of all new conventional petrol and diesel cars and vans by 2040. Full details of the consultation and how to respond are found here. Responses can also be made directly to roberttc.saunders@talktalk.net or telephone 01952 253705 / 07976 697931.